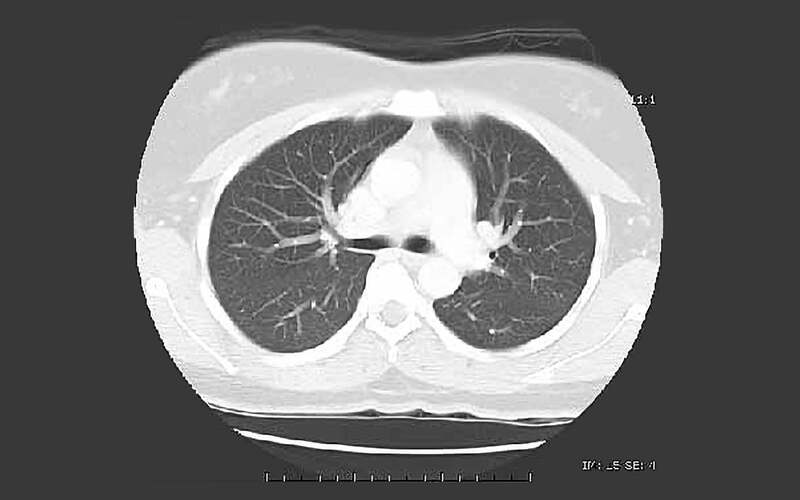 A low-dose CT scan of the lungs, cross-sectional view. Such scans are much more sensitive than standard chest X-rays, and can reveal growths called nodules as small as 2mm in diameter. The vast majority of such growths are benign, but some develop into invasive cancers. Courtesy NCI. Cold Spring Harbor, NY — At the first annual Lung Cancer Early Detection and Prevention Workshop held at Cold Spring Harbor Laboratory (CSHL) in late September, nearly two dozen physicians, research scientists and hospital administrators took a close scientific view of rapid advances made in recent years to identify lung cancer at its earliest stages. The meeting was conceived and supported by the Elisabeth R. Woods Foundation, which supports lung cancer research at CSHL and elsewhere. 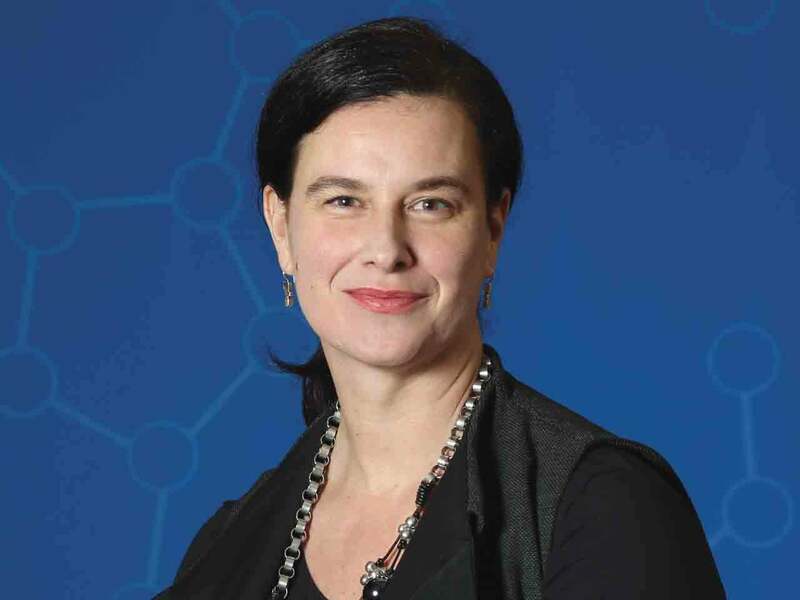 The need for objective critique of screening methods was stressed by workshop participants, who were led by CSHL Associate Professor Raffaella Sordella, a molecular and cellular biologist whose lab focuses on understanding the mechanisms of lung cancer development and progression as well as therapeutic responses. The great tragedy of lung cancer today, noted workshop participant Dr. Jeff Schneider of Winthrop Hospital in Mineola, is that as many as 70% of patients are already at Stage 3 at the time of their diagnosis. Such cancers have already begun to spread and have a poor prognosis. By comparison, he noted, only about 5% of colorectal, prostate and breast cancers are metastatic when they are first detected. A central purpose of the meeting was to discuss the implications of an important nationwide study of lung cancer screening. In August 2011, the long-awaited National Lung Cancer Screening Trial (NLST) was published in the prestigious New England Journal of Medicine. Funded by the National Cancer Institute, the study compared the effectiveness of an old vs. a newer technology in diagnosing lung cancers. Most important, it sought to determine what, if any, role each screening method had in reducing lung cancer deaths. 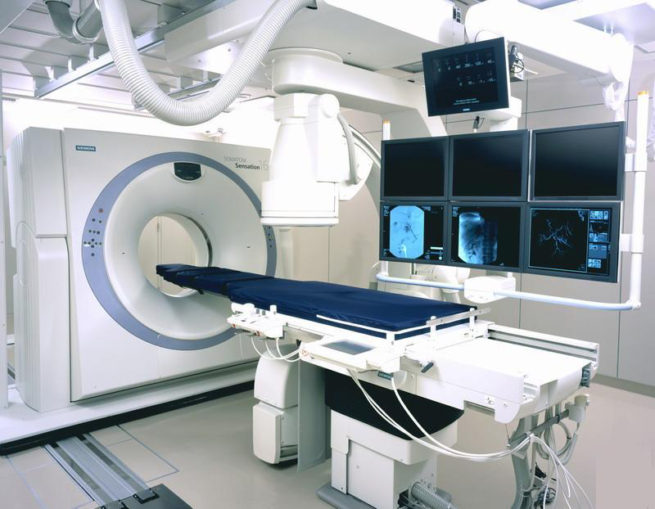 The bottom line on the NLST trial is that the newer technology, called low-dose CT (computed tomography) scanning, reduced lung cancer mortality by 20% vs. the old technology, a single-view chest X-ray. Each method was used to screen 26,700 patients over a 2-year period. Since chest X-rays alone have been shown to reduce lung cancer mortality by about 10% when given at regular intervals to high-risk individuals (typically, those who have smoked heavily over a long period of time—the equivalent of 1 pack of cigarettes a day for 30+ years), the total reduction in lung cancer mortality attributable to low-dose CT scanning is about 30% as compared with no screening, based on the NLST results. A remarkable number in any context, this figure is especially significant in view of the current 5-year mortality rate for people currently diagnosed with lung cancer—83% of all patients; 95% of those diagnosed at Stage 3, and 99% at Stage 4. About 160,000 Americans die annually of lung cancer, and so a 30% reduction would mean as many as 48,000 lives saved per year if low-dose scans were universally given to those at high risk. (As noted at the workshop, this assumes that results of the NLST are reconfirmed over time.) For purposes of comparison, this number of lives saved is greater than the total number of breast cancer deaths annually in the U.S. (40,000) as well as deaths due to prostate cancer (30,000); and it is nearly equal to the 50,000 annual deaths due to colorectal cancer. Workshop participants discussed at length the advantages and disadvantages of the low-dose CT scan approach to screening. While there was general acceptance of its ability to significantly reduce mortality—“its benefits have been understated,” in Dr. Schneider’s view—its implementation on a mass scale was acknowledged to raise several serious issues. As pointed out by Dr. Matthew Schabath of Moffitt Cancer Center in Tampa, questions of cost aside, these include figuring out how to deal effectively with the large number of small lung lesions—“nodules”—that low-dose scans are able to pick up (as small as 2 mm). Not many 2 mm lesions will develop into cancers; indeed, most small nodules (under 5 cm in size) will prove to be “false positives,” if interpreted to be “pre-cancerous,” as several doctors present noted. It is the biological uncertainty about their future course that fuels controversy. A separate but important issue pertains to the reaction of individuals diagnosed with small nodules: some will panic, and demand the nodules be removed, regardless of prognosis. But such a radical course if adopted routinely would be unjustifiable medically, and all but impossible to pay for. A CT (computed tomography) scanner manufactured by Siemens AG. It can be used for a wide range of scans, including the type of low-dose CT scans of the lungs that have been shown to reduce lung cancer mortality 30% in people at high risk, notably current and former heavy smokers. Courtesy Siemans AG. Dr. Vijay Singh, Chief of Thoracic Surgery at LIJ/Huntington Hospital, discussed four distinct technologies with which to sample or remove nodules. Each has different capabilities; is associated with a different cost; and points to the need to systematically study sampled nodules, precisely to learn more about how they are likely to develop in different people and under different circumstances. The North Shore-LIJ hospital system, which last month began making low-dose scans available at no cost to high-risk individuals, is establishing a “nodule clinic” to closely study identified nodules, Dr. Singh said. Soberingly, as noted in a subsequent discussion led by Dr. Adi Gazdar of the University of Texas Southwestern Medical Center, “there is virtually no such thing as a ‘healthy’ lung in a person who has smoked a pack a day for 30 years.” Such people routinely have chronic inflammation of lung tissue, a condition directly correlated with the development of lung nodules, as Dr. Singh noted. Dr. Singh estimated that between 25% and 50% of long-term heavy smokers have small nodules, whether or not they have cancer. In Dr. Gander’s view, 20%-30% of screening-detected lung lesions will need special monitoring over time—i.e., short of surgery to remove them. “We don’t yet know the natural history of such lesions,” he said. Workshop participants noted another less recognized benefit to low-dose CT scans of current or former heavy smokers. Since these individuals are also at high risk for other pathologies such as cardiovascular disease, there are additional health benefits to be gained from having them scanned. This is among the reasons low-dose CT is being offered free of charge at LIJ and a number of other large hospital systems nationwide. The scans promise to bring better care to a population at risk for multiple serious illnesses, saving lives and lowering costs to the system by finding and treating illnesses earlier, when they are more manageable. The still powerful stigma against victims of lung cancer has generally worked to slow the acceptance of screening, workshop participants noted. Beginning January 1, 2015, low-dose scans for high-risk individuals are to be covered under the Affordable Care Act, although the government’s Medicare administration is currently challenging that provision of the law. A decision is expected some time in November. Other presentations at the workshop dealt with scientific aspects of developing reliable biomarkers for lung cancer. A blood test would be a kind of miracle screening tool, but there are serious technological issues. As noted by Dr. Max Diehn of Stanford University, pre-metastatic lung cancers may not shed enough cells into the bloodstream to make detection possible with current methods. Yet he has been able in some more advanced cases to use circulating DNA for diagnostic and prognostic purposes. Dr. Parag Malick of Stanford Medical School, and Dr. Karen Kelly of UC Davis Comprehensive Cancer Center, explained the difficulty of finding lung cancer metabolites and protein biomarkers in circulating blood. Concentrations of the latter are about 12 orders of magnitude less than that of the background against which they need to be detected, according to Dr. Malick. That, he said, is like being able to distinguish a sesame seed from a poppy seed in a field the size of the Earth’s diameter. Another part of the workshop covered new tools to distinguish benign and cancerous lesions. Dr. David Barbie of the Dana-Farber Cancer Institute, and Dr. Vivek Mittal of Weill-Cornell Medical College, discussed how detecting changes in the tumor micro-environment could lead to improved diagnosis. Dr. Fiona Ginty of the GE Global Research Center presented a novel technology that could allow the identification of up to 40 relevant biomarkers in lung tissue samples. This technology, if perfected, would be a great aid to pathologists. Elisabeth Woods Leonard, who heads the foundation named for her mother, who died of lung cancer at age 63 in the year 2000, said that the Woods Foundation looked forward to convening the Workshop next year at CSHL to further clarify issues surrounding the benefits of lung cancer screening.